Discover leather crafting, an enjoyable craft that lasts a lifetime. Master leather artists show you all the basics of preparation, tools, stamping, tooling, carving, edge treatment, forming, moulding, embossing, coloring & finishing, stitching, lacing, braiding, and more. There are projects to interest many different creative souls. Tony Laier has over 40 years experience in the leather industry as an award-winning leather artist, designer, writer, and teacher. Currently Director of Research and Development for Silver Creek Leather Company, Tony is also the master tooler for Steel Strike Leather Products, Inc., a high-end leather furniture company in Buena Vista, Colorado. 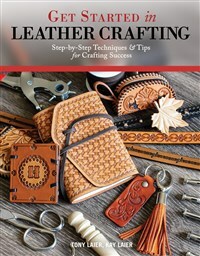 Kay Laier is an instructional writer with more than 40 years experience in the leather arts. Kay is also a multi-media and computer artist, with a BFA from Texas Tech University.